to the Reds' 4-to-12 groundout-to-flyout ratio. I hope those bats kept the Reds' shoulders nice and warm tonight, because it didn't look like they brought them up there to hit Ted Lilly's pitches. Lilly didn't have befuddling stuff on the mound. He had three pitches from what I could see: a fastball, a changeup, and a curveball. He changes speeds very well, and his curveball has a sharp dip, but for the first several innings, the Reds let too many fastballs go by. Lilly is a guy that you have to feast on early. He threw a lot of get-ahead fastballs, but the Reds just sat there with the bats on their shoulders. Once they finally decided that they have to swing the bats to score runs, Lilly was dialed in with his pitch placement. It didn't help that the wind pulled back two Reds homers, easily (Ross and Phillips) and maybe three (Hatteberg). But again, this team needs to learn how to hit with runners on base, and how to GET on base. Almost every Red was trying to hit the ball into the air. The Cubs never really hit the ball very hard, save for a couple of hits. They just punched the ball hard enough through the holes, and they hit with runners on base. That's how you win ball games. Ty Cobb once lamented the death of the "science" of baseball--bunts, stealing bases, and "hitting it where they ain't". The Reds clearly need to go back to science class. For having such a "vaunted" offense, this team clearly has to get all its work done with the first five hitters of the order, because Conine, Gonzalez, Ross and the pitcher aren't going to get the job done. Freel didn't have a good game, setting the tone for the game by striking out looking in the first at-bat of the game. In his expected "breakout" year, Phillips has yet to get a hit. The only people producing in this lineup are the 3-4-5 hitters, and you can debate Encarnacion's production. But on a positive note, how about Bronson Arroyo? He had some nasty stuff tonight. Did Dice-K teach him the gyroball? His curveball and slider were breaking a foot across the plate. As the game wore on, the break started to disappear, but for five-plus innings, he had Cy Young stuff. He had a little trouble placing his fastball and changeup at times, especially early on, but if there was any star in this game, it was him. 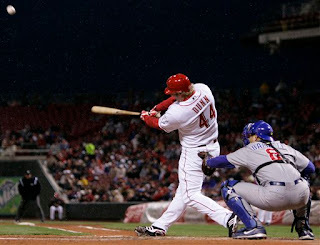 And how about the bunt he dropped behind Lilly? Bonus points for Bronson there. And speaking of bunts, how about that beautiful no-play in the 4th? Nice to see Ross decided to arrange a pow-wow around the ball rather than catch it. And when he did decide to play some baseball, he threw it TO THE WRONG BASE! In that situation, if you are dumb enough to let the ball drop due to lack of communication (that was Ross' ball), you need to turn around and tap home plate. Ramirez was far enough from the plate that Ross could have gotten there first had he snapped his ankle and dragged his helpless body there. We're only two days into the season, but I'm already getting infuriated with Ross. He barely hit .200 after his surprising start last year, and he's starting the season by flailing away aimlessly at inside fastballs and sliders away. He almost hit a home run, which could have redeemed him a bit, but just like everyone else on this team, he's going up there to crush the ball. Choke up, keep your hands back, and hit the ball into the hole. Get on base, Cincinnati, get on base! Kyle Lohse takes the hill tomorrow night. Looks like another winter wonderland at Great American. Let's try to at least make the fan ratio 3:1. It would be a start.